There are many applications for diamond drilling and diamond-imbued drill bits, thanks to their unmatched strength and precision. 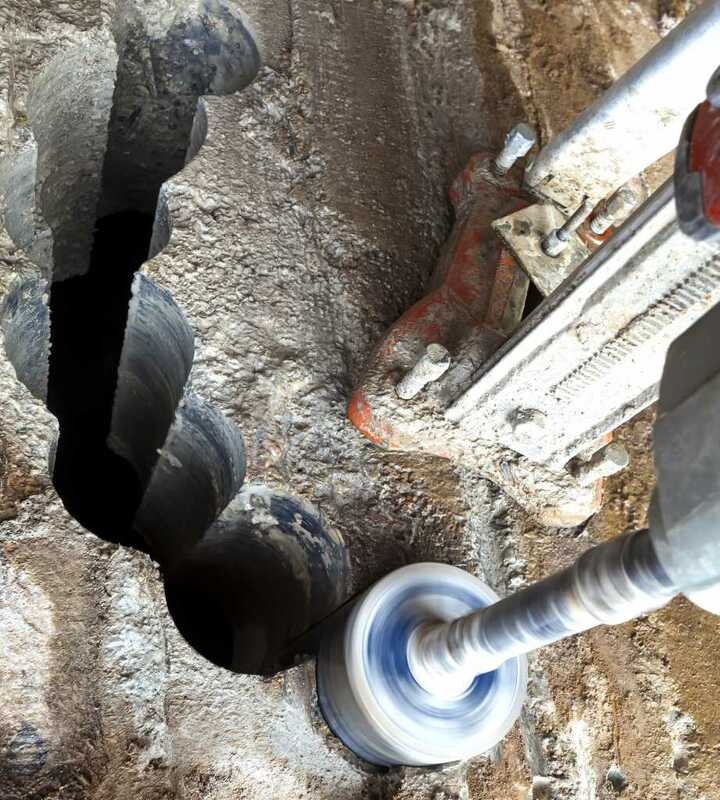 As well as the many uses for diamond drilling on a construction site, diamond drilling can also be used by geologists and in mining for exploratory work. Let’s take a look how diamond core drilling compares to reverse circulation drilling, another prevalent exploratory drilling method. Diamond core drilling involves a hollow drill bit which is inset with diamond pieces and rotates to bore through rock. As the drill progresses further through the rock, a solid rock core is created within the hollow drill which can then be extracted and studied. Whilst in use, water is supplied through the drill pipe to both reduce heat during operation and to wash the rock core pieces. The exact design of the diamond drill bit will differ depending on the type of rock to be drilled through – being that diamonds are so strong, almost any material can be drilled using this method. What is reverse circulation (RC) drilling? Reverse circulation (RC) drilling is carried out with the use of pneumatics – in other words, the drilling force is created using compressed air. This creates a sort of ‘air hammer’ which repeatedly pushes into the rock whilst the drill bit at the end – made of tungsten steel – simultaneously rotates. This form of drilling creates drill cuttings – small chips of rock – rather than the intact rock core created in diamond core drilling. These cuttings are carried up and out of the drill through dedicated tubes and can then be analysed. – The kind of sample each drilling method allows differs. Diamond core drilling is good for precise sampling and analysis of layers; RC drilling is good at extracting bulk samples. – Drilling rate can depend on the ground conditions but RC drilling tends to be quite a lot quicker than diamond core drilling. – Diamond core drilling can be used at much greater depths than RC drilling. – Diamond core drilling is the more flexible option, allowing drilling to be carried out on a wider range of ground types and conditions. Concrete Drilling Services are experts when it comes to specialist concrete cutting, sawing and drilling work. Our team are highly trained, dedicated and skilled, ensuring that we always achieve high standards of workmanship. The state-of-the-art equipment that we use, combined with our proficient operatives, ensures you can rely on all our work to be precise, safe and efficient. For further information or enquiries, don’t hesitate to get in touch with our helpful team today – we operate throughout North West England.